St. Anne's Catholic Church is located in the Eastwood Heights neighborhood of Pueblo. The church was first tended to by the Benedictine Fathers of St. Leander's Parish. 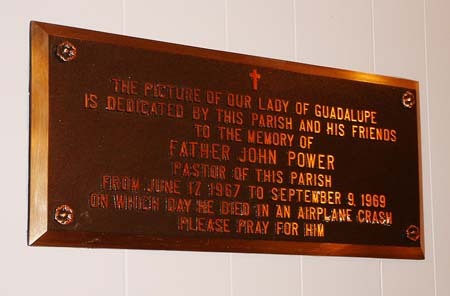 The building itself was a former Army chapel originally located on a World War II era base east of Pueblo on land that was at the time being transformed into what is now Pueblo Memorial Airport. The structure was mounted on rollers and moved across the prairie to its current location. According to an article in the Pueblo Chieftain published in 2006, "Fences were removed and put back, and cuts were dug into the banks or arroyos between the airport and Eastwood Heights as the chapel moved slowly to its new home." Arthur Cordova, a founding member of the Parish, remembers feeling overcome with a sense of awe as the building's steeple came over the hill. "It was as if God was bringing the church to us out of nowhere." The Parish was originally named St. Francis Xavier Cabrini, and celebrated its first Mass on May 13, 1956. Masses were held each Sunday at 7:00 am and 9:00 am. Shortly afterward, an anonymous donor made a $10,000 donation to the church toward the establishment and improvement of the mission. The donation also came with a request that the church be renamed St. Anne in honor of the Mother of Our Holy Mother Mary and Grandmother to Jesus. Bishop Joseph Willging dedicated the church July 29, 1956.
who was one of 89 persons killed in an airplane crash near London, Indiana on September 9, 1969.